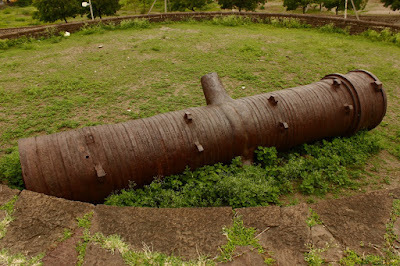 This is one of the least known monuments of Bijapur. 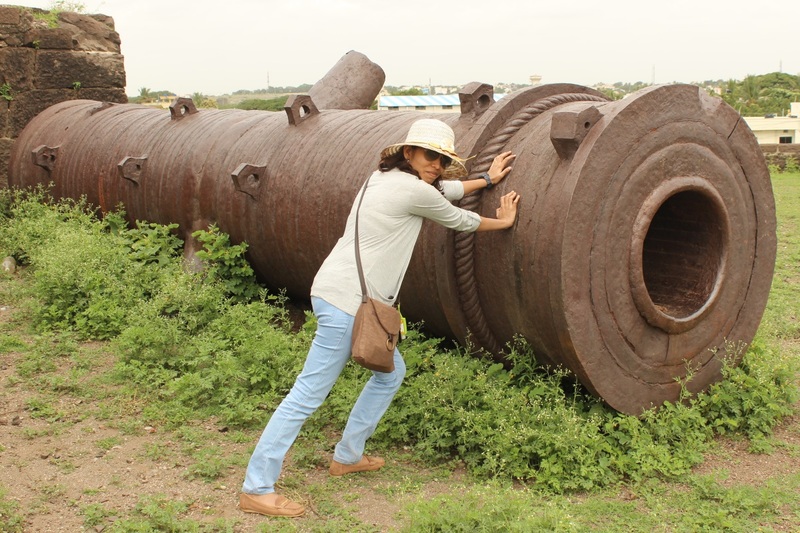 In spite of four visits to Bijapur, no one had mentioned this cannon. I got to know of it from the tourism booklet - which I noticed mid 2016. I'd to wait one year to see this cannon. 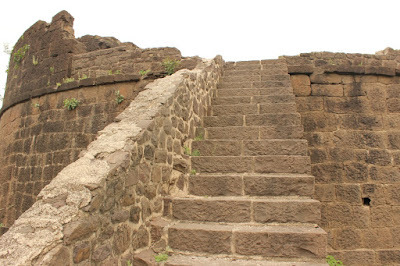 We arrived at Bijapur from Dharwad around 3-30 PM. 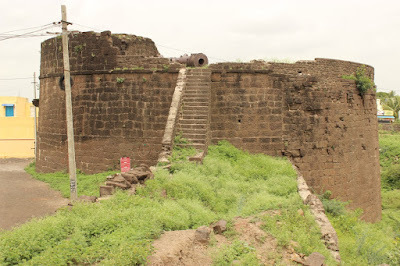 We entered the city from Bagalkot side. I'd few spots planned for the reminder of the day.. until dusk. Since Landa Kasab is situated on a turret in the southern side of the outer fort it was our first stop. Locating the spot was quite easy - people in the neighborhood were friendly. So, this is the turret on which the gun rests. It is a protected monument but the government could've done a better job. First we had to climb a narrow flight of steps to reach the rampart wall shoulder. 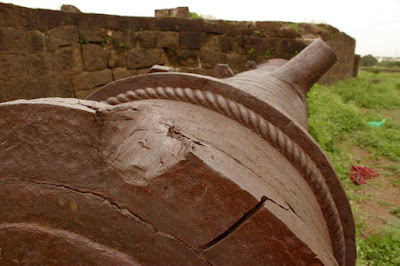 The cannon comes into view. Wondering why there's a wall only on the left i.e. 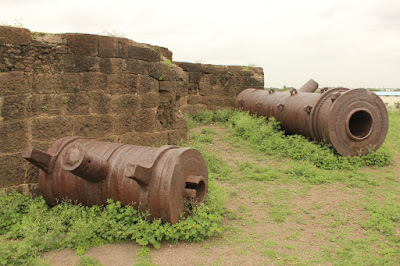 towards the fort. 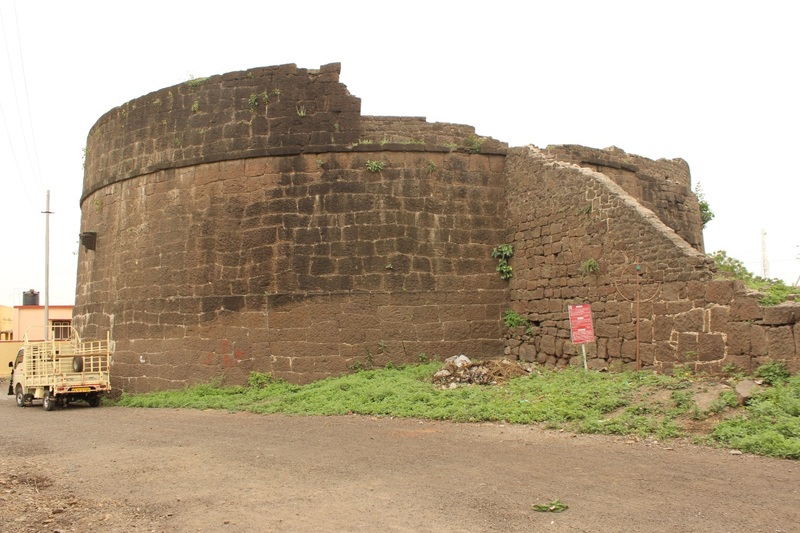 Ideally the wall should've been on the right, to defend people from enemy forces outside. May be merlon on the rampart wall shielded the stairway which have collapsed now. 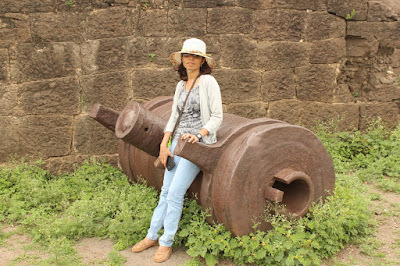 Here we go.. the great gun, its seriously big! Seeing the smaller piece, I thought the gun was broken. On inspection, they were two different guns. 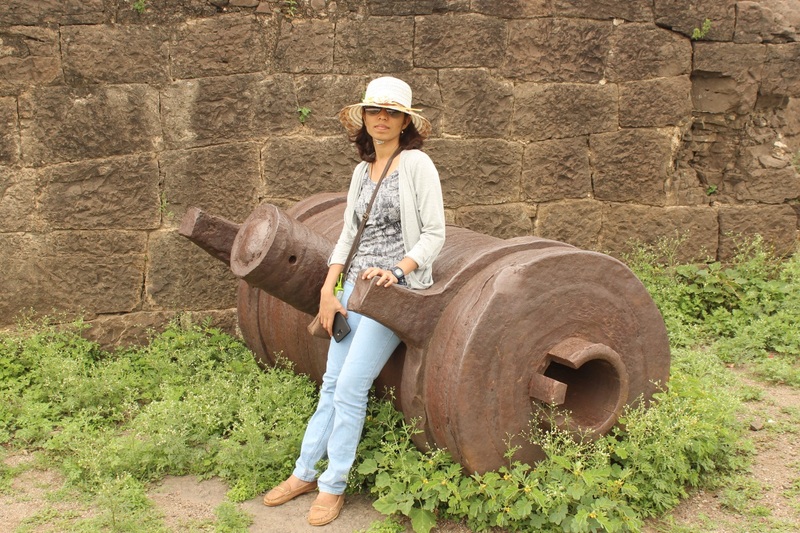 It seems, originally there were two guns here. Lets check out the boss first. Its is about 4½ feet in diameter and more than 20 feet long with a bore diameter of 1¾ feet. 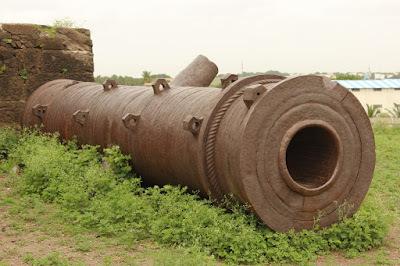 Mentally I compared this cannon with Badi Tope of Bidar fort.. Landa Kasab is bigger. 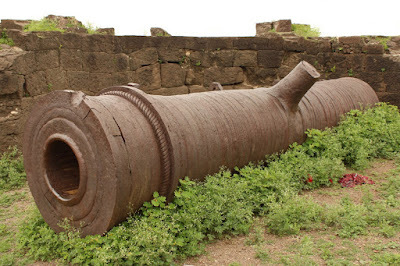 Probably the largest cannon in Karnataka. But, definitely the largest I've seen. Pushpa trying to move the 45 tonne giant :) Check out the hinge shaft.. its is easily a foot in diameter. The broken gun was relatively smaller. Probably a supplementary gun while the main gun was being reloaded. Reloading guns of these sizes would be time consuming activity as the required material had to be moved manually. Back to the boss. Lets look at it from a different angle. We scanned the visible surface, couldn't find any kind of inscription on it. Not that we would've read if an inscription was there but for the sake of discovery. Probably there is one, hidden from view. Surely the cannon would have been mounted on a swivel mechanism to adjust the gun towards the target. The floor would be paved with dressed blocks and also there would be a water pit for the gunner to submerge during firing.. it is said that gunner who lit the fuse would submerge in water to escape the heat and shock. 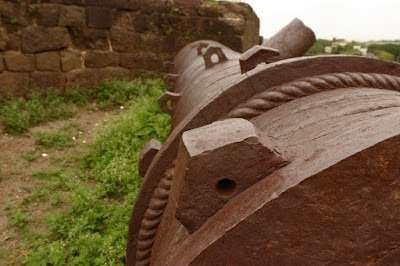 The wall in the background is to prevent turning the gun towards the inside of the fort. 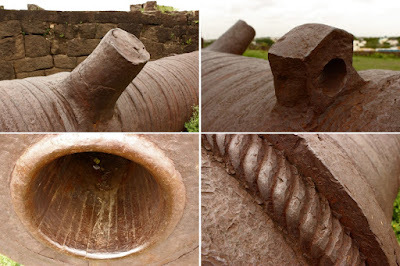 Such walls can be seen in most of the fixed cannons. Imagine the firing.. the amount of heat and sound discharged would be immense. Wonder how much time was allowed between a firing and reload. The two rings around the gun's snout is to provide additional strength to prevent it from cracking up. The front ring is dented, might have happened while transporting the gun from the factory to this turret. The second ring is has an extra twisted ring too. Wondering why the twist. I think the technical term for the second ring is "muzzle astragal." This has a sight too. This is to help the gunner fix the gun's position accurately on the target. The only other cannon with a sight is the Bara Gazi Tope at Gulbarga fort. Closer look at few parts; going clockwise. The swivel shaft. Notch with a hole - this could have been for fixing chains to swing the gun. Muzzle astragal and fillets. 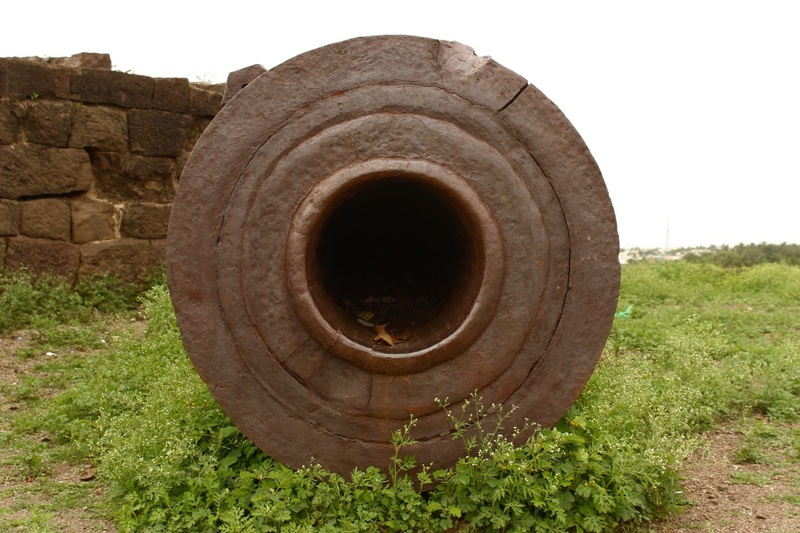 The ribbed bore. The bore and the lip seems to be lined with harder steel. A view from the top.. In my experience this is the most impressive cannon! Check out the largest cannons of Karnataka.